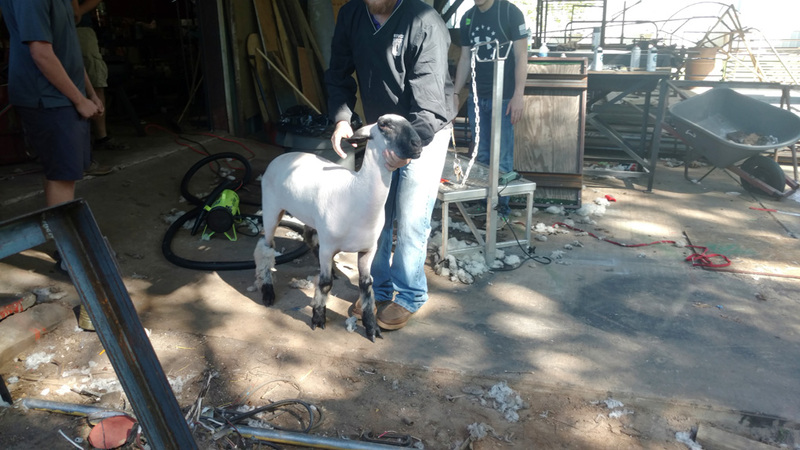 Kennard High School students sheared their lambs for the Houston County Fair and Youth Livestock Show on Friday, March 31. Photo by Cody Thompson / Messenger. CROCKETT – With spring in full bloom it is almost time for the annual Houston County Fair and Youth Livestock Show. As always, this year’s fair and livestock show will be held at the Porth Ag Arena, located at 1100 Edminson Dr. in Crockett. Set-up for the fair grounds will begin at 5 p.m. on Monday, April 3, and will continue until completion. “We like to get the students involved in the set-up process because it gives them more of a feeling of responsibility for the show,” Houston County Extension Office head of family and consumer sciences Mindy Patrick said. Students from all across Houston County have been preparing their animals since (month) for a chance at winning grand prize at the livestock show. Schools with students participating in the fair and livestock show include Crockett, Lovelady, Latexo, Grapeland and Kennard. “We’ve been working hard to get the kids’ animals and any projects they have ready for the fair,” Latexo High School ag teacher Larry Langford said. Latexo High School senior Kursten Catoe, who has been showing animals at the livestock show for the past four years, has implemented a creative training regimen to help get her lamb ready for this year’s show. Kennard High School senior Nick Dodson has been showing hogs at the fair for three years is working hard to get this year’s hog up to the minimum weight of 220 lbs. Lovelady High School sophomore Hannah Barnett has high hopes for her chickens and rabbits that she is showing in the livestock show this year. Grapeland High School sophomore Amy Crook has shown a variety of animals over her seven years as a participant in the livestock show. This year she has chosen to show chickens. Animal check-ins start at 6 p.m. on April 4 and continue through April 7 at the Crockett Civic Center. Students also have the opportunity to enter projects into the home & garden and shop categories. Several Kennard High School seniors built a tilt trailer that they are entering in this year’s fair. The livestock auction begins with the premium sale particiants at 5:30 p.m., followed by the champions sale at 6 p.m. on April 7. The fair grounds clean-up begins at 9 a.m. on April 8 and continues until completion. All students who participate in the fair and livestock show are required to attend the clean-up. For a full list of check-in dates and times, as well as a full schedule of the fair and livestock show, visit www.houston.agrilife.org/houston-county-fair-and-youth-livestock-show or call 936-546-2265.